How many times have you heard people make these jokes? Or maybe you’ve said them yourself. I know I have! As moms, we’re pretty quick to make a joke at our own expense. Sometimes, it seems to lessen the sting of mommy guilt that so easily overwhelms. I don’t think there’s anything wrong with joking. I love a good joke and I’ll never stop giggling at those funny memes that come across facebook. But there is one thing I notice none of my mom friends doing. None of us give ourselves credit for being a great mom. How often do you hear a friend say I’m a good mom! Probably never. How often do you say it yourself, even if only privately and in your own mind? Dear mamas, this has to change. I want each of us to have the ability to look at ourselves, even on the hardest of days and realize what amazing mothers we are. You, precious mama love your children so fiercely. You sacrifice sleep, comfort and so much more just to take care of them, and show them they are loved. You give of yourself so freely, and yet instead of realizing how wonderful you are or seeing yourself through the adoring eyes of your children, you worry that it’s not enough. You see your imperfections instead of your beauty. 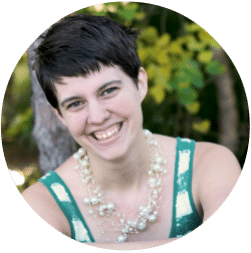 I’ll be the first to tell you I’m an imperfect mom. I mean, you all know that my children frequently eat things like this, that I RARELY clean my kid’s room, that I totally compare my kids to other kids their age and I grin (with relief) when I see other misbehaving toddlers in public. I am far from being the perfect mom. But, really, I’m far from being a terrible mother too. That’s the whole point of this series, to remind all of us that we don’t have to be perfect to be awesome mamas to our kids. That we can make mistakes, and do things different than “the norm” and still be fantastic parents to our own children. Be honest with yourself. Remember your good days, not just your mistakes. Remember the time you made cookies with your kids or spun in circles until you almost threw up. And if it’s been awhile since you’ve had some silly fun with your kids, don’t feel guilty about it, just schedule something fun for this afternoon. Even if it’s just an impromptu dance party in the living room. Make the smile, laugh with them, that’s all that it takes. Admit it to yourself and don’t be afraid to believe it. You are rocking this. And I’m almost positive you deserve more credit than what you have been giving yourself. Don’t be afraid to be a good mom. Because you already are. Just accept it. I know there are a lot of good moms reading this right now, so I’m going to ask you to be brave, and leave a comment admitting it. No disclaimers, not self-deprecating jokes, just tell me you are a good mom to your kids, how old your lucky little ones are, and something fun you’ve done recently together. It doesn’t have to be amazing or pinterest worthy. The most precious memories are oftentimes the simplest. Just take a moment to remind yourself, and then share it with the world. You totally deserve that. I have a special present for you, to show you how much I think you are amazing. Subscribe below to get free weekly emails about real-life motherhood in the midst of the stickiness, the challenges and the imperfections. 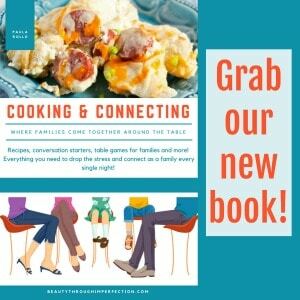 AND I’ll also send you a free digital copy of one of my books, Confessions of an Imperfect Mother. I’d love for you to have it, to laugh and cry along with me at the joys and difficulties of motherhood! That’s awesome!!! My son would LOVE a train ride! :) Sounds amazing! Yes! I am an awesome mum if I may say so myself :-)… Not perfect but definitely awesome. Hmmm….doing away with ” false modesty” can be such a beautiful thing! Yay! I’m a good mum! Actually, I found this quite hard to type. And yes I did make a joke about failing to win mother of the year award on Monday morning upon leaving the house for school when I realised that the kids coats were still wet in the washing machine having been thrown in after our muddy Sunday afternoon walk and promptly forgotten about! Thanks for such an encouraging word, Paula about standing up and saying we’re good as much as we come out with those self-deprecating jokes. yay Mel!!!! :) You DEFINITELY are a good mum! Thanks for the reminder to stop name-calling ourselves. We give each other grace, but not always ourselves. I am a good mother to my seven children. They range in age from 2 to 12. I recently spent the whole day cooking with them, and even though the kitchen and the kids were beyond dirty afterwards, they had fun. I had fun. Thanks for affirming all mothers today. We are truly blessed! Don’t be so hard on yourself, step parents are awesome. It sounds like you have a lot of fun planning special things for them! Trust me one day they will realize exactly how much they are loved by you and they will appreciate it a whole lot! You are never just a srep parent especially when someone puts forth as much effort and caring as you do! I’m changing my thinking starting now! Thank you for this post. I am a GOOD MOM. When I typed that I also tried to think of a great example of how awesome I am, but I could only think of ways I am failing or mediocre tasks that I’ve done. BUT I’M REFUSING THOSE THOUGHTS. I am a good mom because today I am letting my kids take ownership of cleaning their room and bathroom, and letting myself rest for a bit. I am a good mom because I took the kids on an errand and said “no” to them wanting things they shouldn’t have, and said “yes” to more reasonable requests. I am a good mom because I know I yell too much, and I’m trying very hard to not yell so much. I am a good mom because I sat through 3 episodes of Blue’s Clues today, even though I’ve seen every episode at least a dozen times already. My name is Theresa and I am a good mom. My children are 31 and 28. I am a good mom because I raised my kids in a normally dysfunctional home. See http://mthupp.wordpress.com//?s=normally+dysfunctional&search=Go for a funny story about our normally dysfunctional family. It’s hard to admit or accept when you are doing a good job when you see what society says is “good”. I enjoyed reading this. I followed you from mommy moments :) glad I took the time to read your post, I’ll be gentle with myself today :) Have a great week! I have to join in on this because it is such a good idea and I love the positive message! It’s so true that we never want to say we are good moms. I think it is mostly due to not wanting to sound ‘better than’ or full of ourselves. But I think saying it out loud or even typing it like here, is so encouraging! Thanks so much for this post! I am a good mom. I have a 18 month old son and we love going to the park. He is super active and loves to be outside so we try to go everyday! Thank you. We all down play our abilities as moms. Why? Especially when we are trying to teach our children to have self esteem and pride in their abilities, and we aren’t modelling it for them. I am mom to three kids, ages 6,3, and 22months. I am a good mom, because I let them splash in every puddle and squishy mud on our walk home yesterday. They had a blast and were thoroughly soaked. I’m a good mom. Darling Daughter is 10 (going on 14) and in 5th grade. I’m not ‘the permanent best’ anymore (that’s what she used to call me when she was much younger), but sometimes I’m still okay to be around. Right before spring break this year, she saw the issue of Martha Stewart Living with the French macarons on the cover and decided she wanted to make some since one of her school friends has been ooh-lah-lahing about French macarons since her parents took her to Paris two years ago. So we did. We didn’t have time to get them filled before DD left to spend a few days with her grandparents, but for a first effort at macarons, they came out remarkably well, and we had fun doing it. My name is Rachel and I am a good mom. I have an 11 month old, 2 year old and 3 year old foster children. I take them to the park and play with them almost every day. Oh my…I try my very best to be a good mother. Okay, I AM a good mother. That is so very hard to say sometimes! LOL I have Evie (seven), Dominic (nearly five), and Little One (4 months gestation and growing). We’ve just decided to give homeschooling a whirl next year and we’re making small adjustments in preparation. Just a few minutes ago, the kids and I hauled a lightweight bookshelf and beanbag chairs out to build a reading nook. :) It’s not perfect, but both kids spent (a record) 15 minutes coloring, reading, and not fighting within 3 foot of each other. I call that serious success! Im an awesome mom. My daughter is 3 & my son is 2 months. We went to target and it was right next to train tracks and we watch the train go by. Then we went to chik fil a and she played in the play area. She was so excited for the train. Tomorrow we are going to Disney world epcot. Hi, I’m Casey and I am a good mom to my 15 month old. Today he saw our hiking pack in the closet we’ve named Narnia and would be be content until I pulled it out. He then proceeded to try to climb into it. So, in my shorts and flip flops, I loaded him up, strapped him on and walked around the block in the hot Hawaii afternoon son. He loved every short minute. Thanks for sharing this. I really needed it. 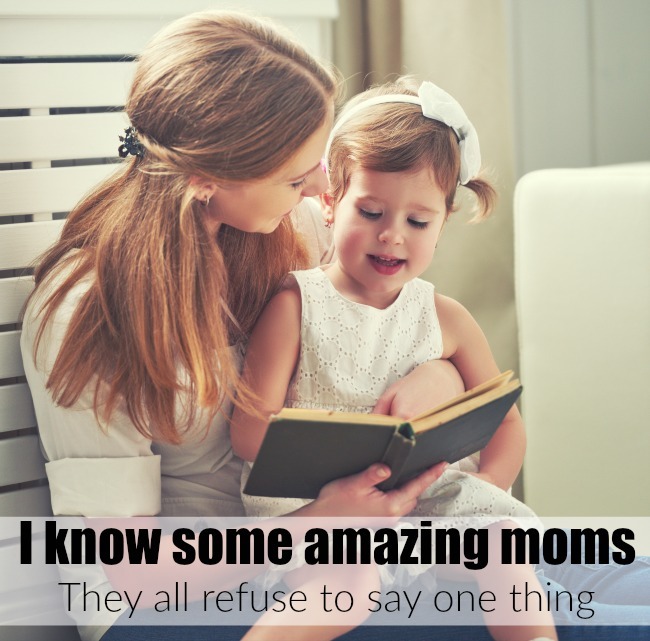 Hey Buddy!, I found this information for you: "The One Thing Good Moms Refuse To Admit". Here is the website link: https://www.beautythroughimperfection.com/refuse-to-admit/. Thank you.